This soft cake is one type of Manchu-style candied fritter. It immediately melts away in the mouth. 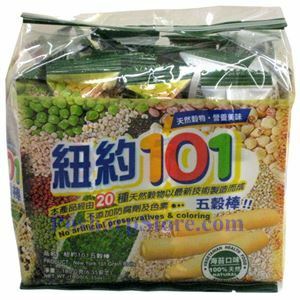 Ingredients: Brown Rice, Husked Lotus, Pearl Barley, Buck Wheat, Oatmeal, Barley, Millet, Glutinous Rice, Soya Beans, Haricot Beans, Pea, Small Red Beans, Mung Beans, Speckled Kidney Beans, Black Soy Beans, Black Glutinous Rice, Corn, Sesame, Pine Nut, Walnut Kernel, Egg Powder, Palm Oil, Sugar, Soy Sauce Powder (Soybeans, Wheat, Salt, Sugar), Malt Powder, Seaweed Powder.